to view and control the ads displayed on your website. You've recently told us you'd like to see more options to search for specific ads. Today we're launching two new filters which will give you even more control. When you identify an ad that you want to block, you can choose to find related ads, e.g., ads that have the same landing page or advertiser. We've enhanced this feature, so that now when you run a "related ads" search, you'll also see ads that look similar too. This filter can help save you time looking for similar ads to allow or block. If your website is international in scope, ads on your website can show in different languages. 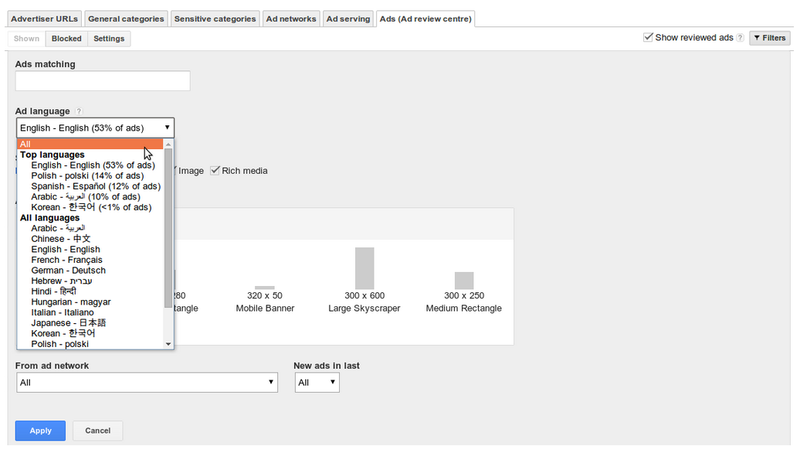 Now you can filter ads running on your site by language in the Ad review center. For example, you could choose to see all Spanish-language ads that have shown in the last 30 days. You’ll find more information in the Help Center on how to search for ads in the Ad review center. We’d love to hear your feedback and suggestions in the comment section below. Many of you currently use the Ad review center to view and control the ads displayed on your website. You've recently told us you'd like to see more options to search for specific ads. Today we're launching two new filters which will give you even more control.